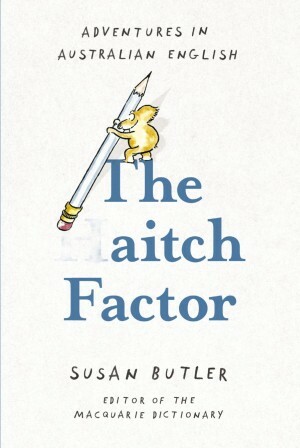 If you've ever been interested in the history of words and phrases in Australian modern English (as well as the development of new ones), then The Aitch Factor by Susan Butler is the book for you. Susan Butler began working at the Macquarie Dictionary as a Research Assistant in 1970 and is the current Editor; being uniquely situated to offer decades of experience on all manner of topics relating to the English language as it is spoken here in Australia. I found myself laughing at some of the entries and observations, and Butler's sense of humour definitely shines throughout on almost every page. She discusses the subtle differences in language between the states and territories, as well as touching on regional words and slang, which I found very entertaining. One of Butler's roles at Macquarie is to collect new words (like firescape*), and determine when they should be added to the dictionary. Words like binge-watching, dental-tourism and facepalm seem self-explanatory and clever constructs and indicate an ever changing use of slang and buzz words. What I found most shocking though, was Butler's stance on the apostrophe. I agree that the humble apostrophe is largely misused these days, but she believes we can do without it completely. I'd hate to see this happen, but what do you think? The Aitch Factor is a great read for word lovers and trivia buffs the world over. * Firescape means: to arrange the features of a garden (or other area of land) in a way that inhibits the spread of fire. Who knew? Source. I'm all for dropping the apostrophe, in most instances, I can't see it ever happening though.